I was able to read this before its publication date, courtesy of NetGalley.com. Thanks, guys! I am usually good for half a dozen books at a time, but I have to admit that this one story has dominated my reading hours for the past week or so. I had so many preconceptions (and yes, stereotypes) that I didn’t even realize I’d developed until I read about these brave souls who have gone to Afghanistan and in some cases, Iraq. 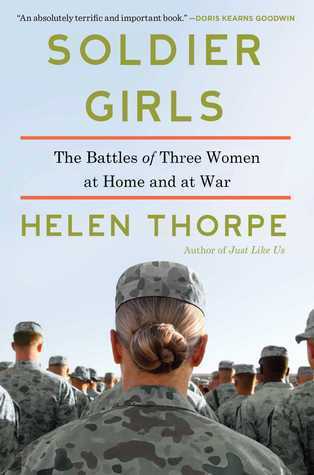 What kind of woman leaves the home she knows and signs up for the National Guard? Sometimes (often!) it is someone who needs money quick. Sometimes it’s a woman who is desperate to get out of her current living situation. And once in awhile, it is something done, at first, when one is dead drunk and out of control; the Guard will fix that quickly! I’ve been a Marxist my whole adult life, and I have no athletic talent or inclination whatsoever. If I loved this story–and I did–then almost everyone will. My past stupefaction with people who signed up for the military and then were somehow surprised when they were sent to go to war is gone. I get it now. And I understand completely what alienation and culture shock awaits someone who has lived under a completely regimented structure in a Third World nation for a year or more, and then comes home to blaring advertisements for things nobody needs and the petty-sounding complaints of those who have always had it soft. This entry was posted in biographies and tagged biography; military history-in-the-making by seattlebookmama. Bookmark the permalink. Now that this title has created some buzz, I thought I’d reblog this!